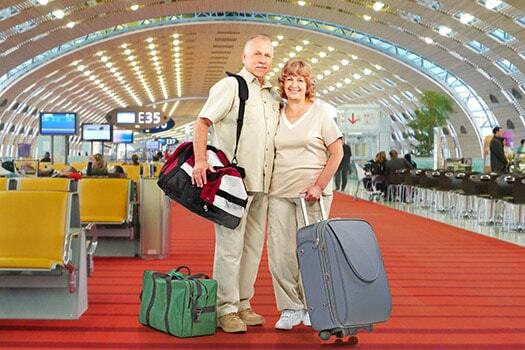 Traveling with your aging parents can be a wonderful experience for all members of the family. Children and grandchildren can get a chance to enjoy some quality bonding time. A trip can help alleviate your parents’ boredom and some of the stress that comes with growing older. You may need to overcome a few obstacles when traveling with elderly parents, but a little planning ahead can help make your trip safe and fun for everyone. Caring for a senior loved one can be challenging for families. Rhode Island elderly care experts are available to provide high-quality care to seniors on an as-needed basis. From assistance with mobility and exercise to providing transportation to the doctor’s office and social events, there are a variety of ways professional caregivers can help your aging loved one continue to live independently. While younger family members can go from one tourist destination to another all day, your older loved ones may grow tired if constantly on the go. They may need to make extra trips to the bathroom or eat smaller meals throughout the day to keep their blood sugar in check. Add breaks in between stops, and always give your parents the opportunity to rest or sit out an activity without making them feel excluded. Many seniors take at least one or two medications, so refill those prescriptions before you leave. Make sure you have enough medication to last a few extra days after the trip ends in case you get stuck or do not reach home when planned. If you are flying, keep the medications in your carry-on bag in case your luggage is lost or delayed. Most hotels, airports, and airlines offer accommodations for people in wheelchairs, but you will need to plan ahead. Check which hotels in the city you are visiting offer wheelchair access and shower rails. Call the airline to see what it can offer your parents to help keep them comfortable while boarding and during the flight. Some seniors may not require a wheelchair daily, but mobility and stamina may become an issue when walking across an airport or spending long days shopping and sightseeing. Consider renting or borrowing a wheelchair for the trip. Most airports offer complimentary wheelchairs for travelers with limited mobility. With a wheelchair your parent can still enjoy the trip without worrying about getting hurt or becoming too tired. If your loved one does not have a cellphone, consider purchasing a prepaid one for the trip. If you and your loved one become separated or if you have to leave him or her at the hotel, the two of you can stay in touch through a cellphone. Program important phone numbers into your loved one’s cellphone. Consider getting an identification bracelet or some type of GPS for seniors with dementia or memory loss. If your elderly loved one has been diagnosed with dementia, trust in the Rhode Island dementia care experts at Home Care Assistance to help him or her manage the condition while continuing to live at home. In addition to high quality dementia care, we also offer specialized Alzheimer’s, Parkinson’s, and stroke care. Seniors often have special dietary needs, and not every restaurant will cater to these needs. Do some advanced research. Check out the restaurants at your destinations and even those along the way if you plan to drive, and see which ones are suitable for your parent’s needs. Also pack some healthy snacks and water for your loved one. Help your loved one pack comfortable clothing for a trip. If he or she packs alone, make sure he or she knows the temperature at the destination. Pack according to whether your loved one is warm or cold-natured and include some sweaters or clothing that can be layered. Avoid tight-fitting clothing, shoes, or accessories because these can cause circulation issues. If you are the primary caregiver for a senior loved one in Rhode Island, respite home care is available when you need time away from your important caregiving duties. At Home Care Assistance, our respite caregivers are available 24 hours a day, 7 days a week to help your loved one manage everyday tasks in the comfort of home while you have the chance to take a much-needed break. Call (401) 284-0979 to speak with a friendly Care Manager and find out about our elder care plans.